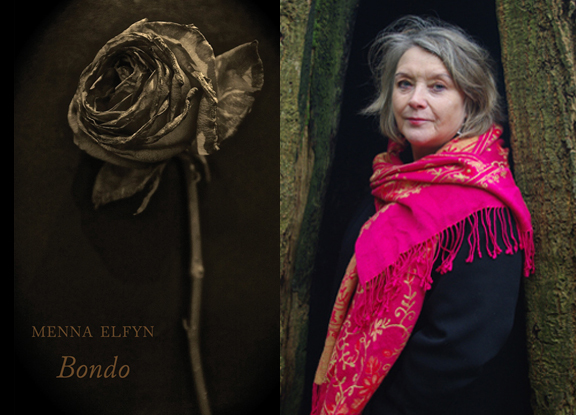 A new collection of poems from Wales’s best-known and most travelled Welsh-language poet, Menna Elfyn, was published on 26 October 2017 by Bloodaxe in a dual language Welsh-English edition. Bondo (Welsh for eaves) was launched with a series of readings in England and Wales ain 2017, including one at the Hay Winter Weekend. Bondo has at its heart a sequence of poems in response to the mining disaster that took place at Aberfan on 21 October 1966. These poems were written over a number of years in private journals and notebooks, and reflect a deep and continuing connection with the mining communities in Wales. Menna Elfyn’s poem ‘The Gate’ / ‘Y Glwyd’, first published in her 2012 Bloodaxe collection Murmur, is reprinted here in remembrance of the loss of her grandfather in a mining accident. Menna Elfyn was one of Ian McMillan’s guests on The Verb on 1 February. Menna read two poems on the programme, ‘Nebbish’ and her poem ‘Unravelling’ about the 1966 mining disaster at Aberfan. She also read her beautiful love poem ‘Love Knot’ for the podcast, and the guests discussed it before settling down to eat cake. All these poems are from her 2017 Welsh-English collection Bondo . She started off by reading the original Welsh version of the poems, and then read the English translations. Menna joins the discussion at 5.58, but her main contribution begins at 33.26. Download the podcast to hear Menna Elfyn read and talk about her beautiful love poem ‘Love Knot’.